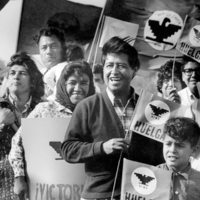 UFW Stories: "March to Sacramento, 1966"
My father, Henry, was an early supporter of the UFWA. He had a strong belief in the value of the work done by farm workers and felt that many growers mistreated and exploited their help. I was young at the time, not even a teenager, and traveled with my father to meetings, rallies, etc. during the March to Sacramento in 1966 we joined in and became more involved with the UFWA. I am honored to be in the attached photo, I am the girl with the curly hair just to the right of Cesar. I went on to be an activist in high school and college; always supporting the UFW causes and then went to work for the UFW when I ended my college career. I first worked in the organizing department out of the Selma Field Office, then was trained in contract negotiations. I eventually went to Sacramento to work the lobbying effort for the Agricultural Labor Relations Act. After we successfully lobbied the ALRA, I was assigned to the Legal Department and investigated cases of unfair labor practices in the areas between Delano and Livingston. I went to live in La Paz, the National Headquarters, and left the UFW in 1978. The training I received from the UFW allowed me to apply for, and get, a job with Fresno County as a criminal investigator. I held this position until my retirement in 2007. I will be forever grateful to the UFW for educating me in areas that schools can never teach; the kinds of things you have to experience in order to understand. Since leaving the UFW I have tried to help out in whatever way I can.